According to the ABI’s latest figures, all age groups over 21 have experienced rising costs over the last 12 months. While younger drivers’ premiums are being kept under control by the increasing use of telematics, they’re in the minority. Drivers in their late 50s and late 80s faced the highest rises last year – nearly £35 per annum. The average annual premium is now £462. That’s up by £33 or 8 per cent compared with the same period last year. However, independent price comparison company Confused.com says the cost is greater still. It has been tracking the average cost of insurance for every quarter since 2006. In 2017, it says drivers have faced average car insurance bills of £781 a year. Confused.com claims that’s a rise of £110, or 16 per cent on the previous year. Insurers have found themselves hit by a triple whammy of influencing factors. First is the compensation culture and bogus personal injury claims. In 2015, the ABI says there were 69,000 fraudulent motor claims made, costing £780 million. The second area to have an impact on insurance costs is the complexity of modern cars. Increasingly sophisticated electronics require specialist equipment and training to be fitted and calibrated. Even simple body panel parts are becoming more expensive due to the weak pound. Over the last three years, the average repair bill has risen by 32 per cent, to £1678, according to the ABI. Last but definitely not least is the increase in insurance premium tax. Until 2015, it was 6 per cent. But it has been steadily increased by the government to 10 per cent. It will go up again, to 12 per cent, this June. What are car insurance premiums spent on? 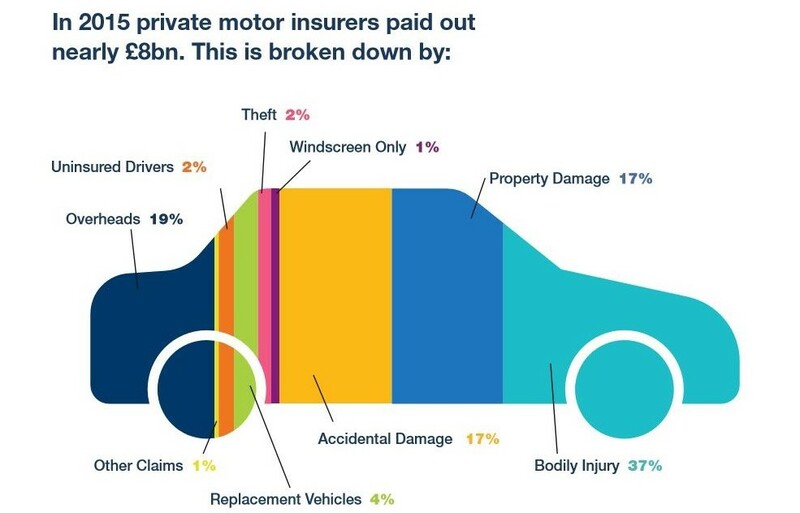 The Association of British Insurers produced the graphic above to show how drivers’ premiums are spent by insurers. The ABI also points out that Insurance Premium Tax is on top of this. If only there was. Earlier in the year, the government introduced reforms to put the brakes on whiplash claims. This was expected to lower car insurance premiums by an average of £40. However, changes to personal injury compensation rules could negate that. Previously, courts took 2.5 per cent off any compensation pay out awarded to individuals. It was done to reflect the interest a victim will earn on the lump sum when they put it in the bank. But after late March, the rate was changed to minus 0.75 per cent. This was to reflect the fact that interest rates are so low for consumers. How can drivers reduce their insurance costs? Read our guide to cutting the cost of car insurance premiums. This offers advice on areas including shopping around, picking a car with a competitive insurance rating and keeping the car garaged. Rip off Britain – again! I see the government take a nice slice of the cake without us knowing and they have certainly got to sort out the compensation culture. Always the consumer that has to fork out! It is high time the insurance companies started to confine higher prices to those drivers who make the claims and to leave alone those who do not. With modern technology sorting those who do from those who do not would be a doddle. My van insurance has tripled. No comment. Blame your government not the Insurers! The reduction in the discount rate to 0.75 and raise in the IPT (Stealth tax) to 12% has had a major impact on costs to the consumer. Wait for the next kick as IPT goes up to match VAT rate! Its going to happen! Another reason for high costs is the number of companies involved when making a claim, I am waiting for my claim to be sorted since December 2016, there have been six different companies involved who will all want a slice of the pie, and who pays for that?? Me!!! Absolutely ridiculous , and still waiting. If the Government negotiated an overall rate for the legally required third party insurance and included that in the road tax it would guarantee that every driver was legally insured at an affordable rate and that the insurance companies would have to be very competitive in arranging premiums for comprehensive cover. I reported two incidents where someone caused minor damage to their car driving into my towbar. No damage to my car and no one made a claim yet it now sits on my insurance record as two claims. For what? For being honest. i reported the incident incase the individuals claimed i had reversed into their cars and then drove off.Interesting since i wasnt even in the car when it happened on either occasion. Now i have a tarnished record and my insurance company didnt even want their number plate. Considering i have 79% NCD it apparently counts for nothing when premiums go up. Suffice to say after that i refused to renew with that insurer.